Info "Be sure to add the right toppings!" Toppings! is a downloadable microgame in WarioWare: D.I.Y. and WarioWare: D.I.Y. Showcase. It was released on October 7, 2009 in Japan, September 6, 2010 in North America, and October 8, 2010 in Europe. 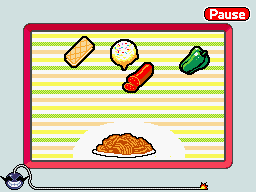 At the start of the game, the player is given either a parfait or pasta with four potential toppings, placed at random on top of the screen. The goal is to select the appropriate toppings for the food. Ice cream and the wafer should go with the parfait. Salami and green pepper should go on the pasta.